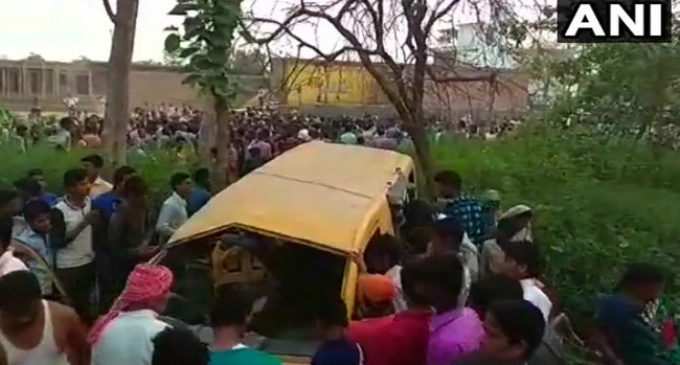 13 school children died on the spot and eight suffered injuries when the school van in which they were travelling was hit by a train at a railway crossing in Kushinagar on Thursday morning. Taking serious note of the incident, Uttar Pradesh chief minister Adityanath ordered immediate assistance to the victims and their families and directed Commissioner Gorakhpur to conduct a probe into the mishap. There were reports that Adityanath may visit the site of mishap and meet the family members of the schoolkids. Prime Minister Narendra Modi and Union Home Minister Rajnath Singh also tweeted expressing their condolences over the deaths. The incident took place at around 7.30 am at Bahpurva railway crossing under Vishnupura police station of Kushinagar district. The van driver also died on the spot. There were unconfirmed reports that van driver was listening to music using earphones when the incident took place. The train involved in the incident was on its way to Gorakhpur from Sivan. The van was carrying over 20 school children. “ A Tata Magic school van carrying school children collided with passenger train (55075) coming from Sivan to Gorakhpur at unmanned railway crossing number 45, around 7.30 am. The gate mitra tried to stop the van driver but he didn’t stop and his van somehow stopped at the track. The railway crossing comes under Banaras division where the accident took occurred in which 10-12 children died on the spot.” CPRO, NE Railway, Sanjay Yadav said. The commissioner of police Anil Kumar, SSP Kushinagar and DM Kushinagar have reached the accident site in and CM Adityanath is likely to visit by 11 am. As per locals, the van was speeding and suddenly stopped near the railway line when the accident occurred. The school bus was carrying children of Divine public School at Dudhi Bazar.